So sad because this will be my last reflection for this semester. Time flies so fast. Exam is just around the corner. OMG. First of all, I would to say THANK YOU VERY MUCH DR FARIZA. You taught me a lot of thing. I really appreciate that. I am so glad to be one of your students in this course. All the input that I've gained from you I will definitely apply it to my daily life. Thank you so much sebab dedahkan kami dengan penggunaan Google Drive. It helps me a lot especially when doing assignments. Now, I often to use Google Docs, Google Presentation and also Google Form in order to complete my assignment. The moment that I will never forget is when you asked us to fill up the student marks by using Micsrosoft Excel. I feel like a real teacher. I can really feel how exactly teacher is all about. I realized it is not easy to all that such thing. And yeah, being a teacher is not an easy job. Terima kasih atas segalanya Dr.Fariza. Saya harap kita akan bertemu lagi di masa-masa yang akan datang InshaaAllah. Alhamdulillah. We've already done with our video regarding E-Learning and Mobile Learning. So sad because Dr Fariza cannot see our presentation as she have an important thing to attend. Never mind. I hope you will see our video soon :) I find it is quite hard to make the video using GoAnimate. Takes time but it's all worth it. The problem is, we can't remove the watermark on the video so it might be distracting to those who it. By using the same topic that was given which is E-Learning and Mobile Learning, me and my groupmates decided to make a video using GoAnimate. GoAnimate (formerly known and sometimes stylized as Go!Animate) is a cloud-based platform for creating and distributing animated videos. It allows users to develop both narrative videos, in which characters speak with lip-sync and move around, and video presentations, in which a voice-over narrator speaks over images and props, which may also move around. The service is provided on a freemium basis to consumers, and has multiple subscription levels available for businesses. GoAnimate provides users with drag-and-drop tools that the company's website indicates can be used to access thousands of character models, backdrops, and other assets to create scenario-based videos - like political videos depicted during the 2012 presidential campaign.The platform offers text-to-speech character voices with customizable environments. Text is the basic basic use of multimedia. It involves the use of text colors, fonts, types, sizes and background color. Graphic helps multimedia illustration attractive and interesting. They help illustrate ideas through pictures. A multimedia video may require the use of speech, musics and sound effects. These are called audio. Video provides a powerful impact in multimedia program. Videos are large in size and takes a while to transfer it. Animation is a process making static images look like it moving. In order to make a good video for example, you must include all the elements that have been stated above. Thank God we've already done with our Online Survey (Google Form). After we analyzed all the data, we started to make a report regarding to this task. Its not that hard to analyze all the data that been collected because by using Google Form we don't have to do that. All the data will be automatically being analyzed. I'd prefer to use Google Form whenever I want to do an Online Forum. Easy like 1,2,3. After we're done with the Google Form, I am so thankful to my friends because they've participated in answering the Google Form. Without their cooperation, we're not be able to get all the responses. Thank You TESL, Special Edu and Sport Rec students. Assalamualaikum and a very good day to all. To be honest, Google Form is the best medium that I can use to collect data for my assignment/task. A big thanks to Dr.Fariza. Google Form makes my work become easier than before. I don't have to print it out the 'Borang Soal Selidik' , all i need to do is create the Google Form and share it to my friends and ask them to fill it up. The best thing is, I can see all the responses directly without making an analysis by my own. Ohh I love it. Assalamualaikum and a very good day to all. At first, I know nothing about CASPER. But when Dr.Fariza showed us the slideshow about the CASPER i was like 'ohh ini rupanyaaa' . I realized that in order to create a good slide presentation, we need to apply CASPER principle . These are our slide presentation. We applied CASPER Principle through this presentation. Assalamualaikum and a very good day to all. So for week 4, we've been asked to make a Google Presentation based on the topic that was given. 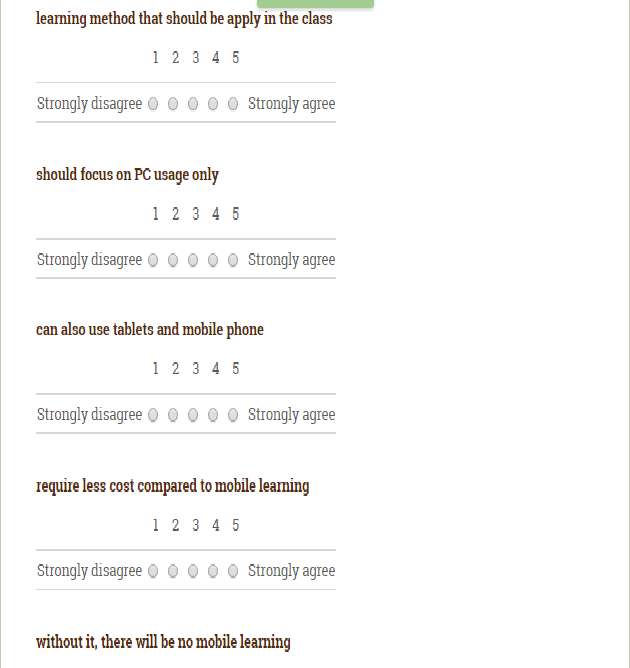 Me and my group got E-Learning and Mobile Learning as our topic. This topic is quite easy since all of us are familiar with E-Learning and Mobile Learning. Am I right? Mobile learning is defined as learning across multiple contexts, through social and content interactions, using personal electronic devices. I'm pretty sure that all of us have our own smartphones right? In this 21st centuries, we can learn through our smartphones. Isn't it cool? You can learn anywhere and anytime. E-learning and mobile learning both have the pro and cons. It is depends on how we are using it. So make it worth it. Do not use this technology to do something that are not benefecial ok? Khuzaimah Bahari, 20 yrs old. TESL-ian UKM, Bangi. From Papar, Sabah.